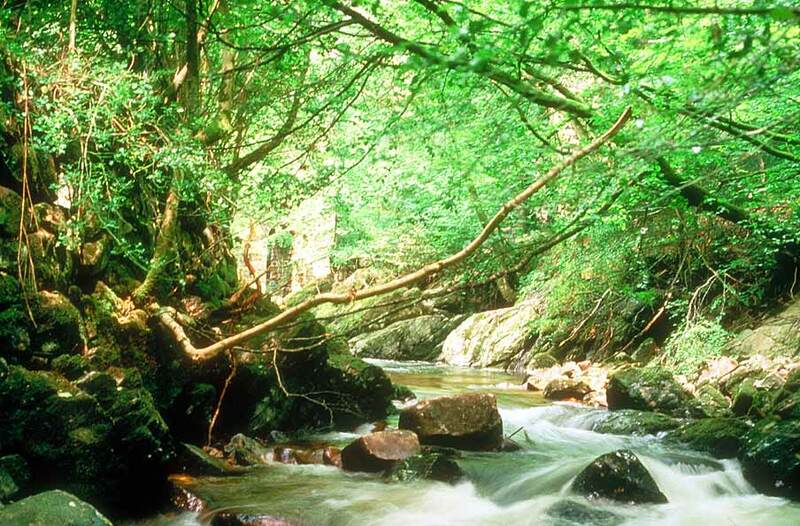 Ivybridge has a magnificent natural setting and boasts centuries of history both as a mill town and as a staging post on the route from London. The first recorded mention of the town was in 1280 when it was described as a dowry of land on the west side of the River Erme, by the Ivy Bridge. For many years, the bridge spanning the river was only wide enough for pack horses and riders. By the 18th century, Ivybridge was a small, thriving community based around the former London Hotel, which was a coaching inn on the Exeter to Plymouth road. The principal landowners were the Rogers family and the estate included Harford, Ugborough, Ermington and Cornwood. The boundaries of these parishes met at the old Ivy Bridge. The river became a source for water power and industry prospered around the bridge. In the 16th century, there was a tin mill, an edge mill, a tool mill and a corn mill. These were later followed by a tucking mill, for cloth-making, and two paper mills. Water leats directed the water to the mills. More recently the village had its own gas and electricity works and a cinema. As the village grew the bridge was widened to allow heavier traffic to cross the river. This was the only means of crossing the river until 1819 when the turnpike was straightened and the New Bridge was built. This linked the main Exeter road with Fore Street. Since 1817, the population has grown from less than five hundred to around twelve thousand. The fast flowing River Erme has always been the lifeblood of the town. Originally providing power for the mills - one of which still exists - the river now marks the start of walks south along the Erme Valley Trail and north to Dartmoor. The town is also at the start of the Two Moors Way. At the northern end of the town centre is the medieval packhorse bridge, the original Ivy Bridge. It has been painted by many important artists including Turner. A little further upstream, the Victorian railway viaduct spans the valley and provides a striking backdrop to the town. At nearby Longtimber Woods the pillars remaining from the original 1848 Brunel structure can be seen. The engine house of the Lower Mills is now used by a sail maker and antique bath restorer. The Old Post House and the former Grosvenor House were built around 1800 as a coaching inn, the Rogers Arms. The first local Post Office was situated within the Old Post House. The pedestrianised Fore Street and Western Road were part of the main route from Exeter to Plymouth until the bypass was opened in 1973. From 1793, a cattle market used to be held on the site where the modern health centre now stands. William Cotton lived in Highland House from 1839 to 1862. He collected the paintings of his friend, Sir Joshua Reynolds, and bequeathed these to the museum in Plymouth. Tremarron Court was the Dame Hannah Rodgers School, founded in 1787 for the poor children of Devon and Cornwall. Not far away is the parish church of St John, built about 1882. On the left, the gates on the corner of the lane leading to Victoria Park were the entrance to the former Chapel of Ease built in 1789 and since demolished. On Harford Road are the Paper Mills, which have been producing quality paper since 1787. The public gardens, car park and picnic area on the right, formerly belonged to the London Hotel. Trails follow the edge of the local nature reserve in search of wildfowl.